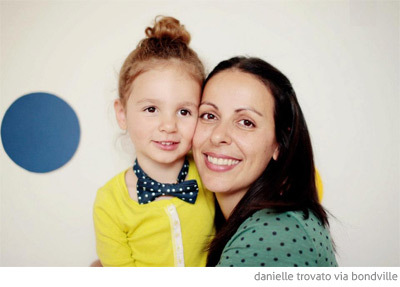 I really connect with Photographer Danielle Trovato's sense of style and love her use of colour and clean, simple design. I've featured her daughter Ruby's bedroom here on Bondville before and it is still one of my favourites. 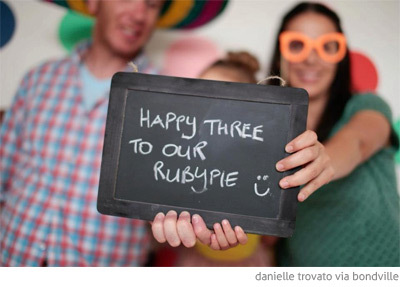 So of course I asked Danielle if she would share some tips the effortlessly chic 3rd birthday party that she put together for Ruby. 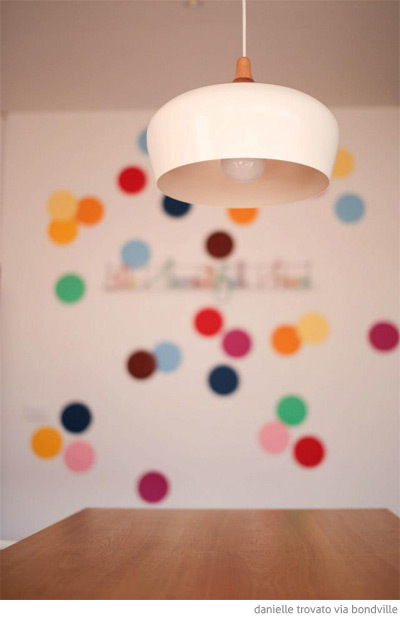 I love that it's not too fussy or complicated, with the focus on the amazing cake and the feature wall inspired by Beci Orpin's crafty-cool Find & Keep book. Happy birthday Ruby! 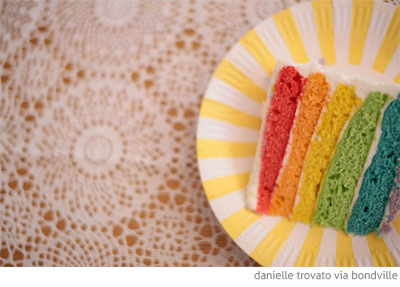 Cake: The amazing rainbow cake idea was found on Pinterest (where else)! 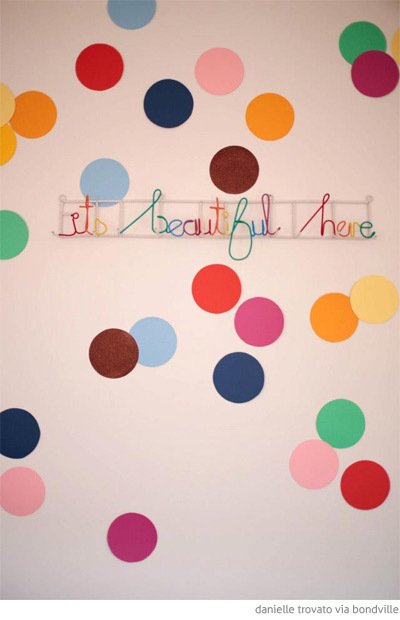 and was made by my lovely and super talented friend Shannon Osborn (follow Shannon here on Pinterest). This cake was the star of the party and honestly the rest of theme was designed around it. It was such a big hit with the kids. 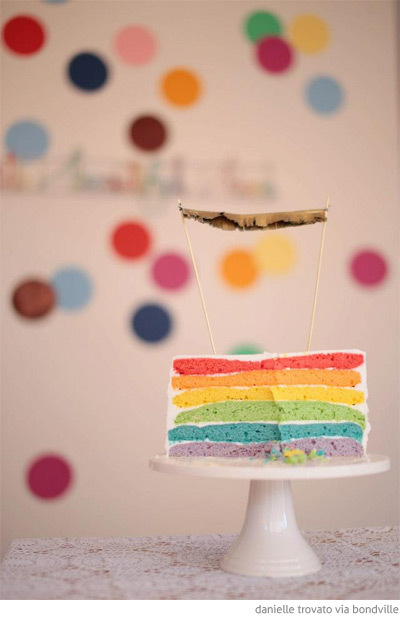 Ruby is still talking about her rainbow cake - she really loved it. Party food: I always like to keep party food at a child's birthday simple, wholesome and easy. We made up a table of savoury food outside for a light lunch. Since most of the kiddies are quite young we kept it to simple fuss-free sandwiches - you can't go wrong with these. We had lovely gourmet pizzas cut up into canape-style servings, assorted fresh crusty rolls made up with ham, swiss cheese, lettuce etc and homemade chicken and veggie sausage rolls. Desserts were equally simple with a selection of fresh muffins, cupcakes and fresh fruit skewers. Decorations: We set up the party outside on our deck which extends off our living/kitchen area. 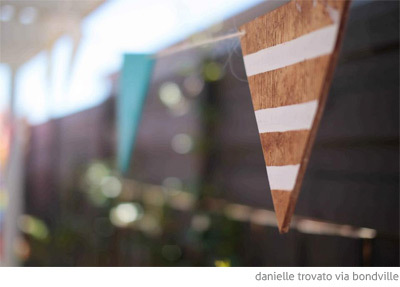 We decorated this with simple wooden hand-painted bunting purchased from White Nest in Blairgowrie, VIC. Inside we made a giant confetti wall using inspiration from the Beci Orpin book Find & Keep (read more about Find & Keep here on Bondville). Outside above the deck we hung a giant rainbow "3" pinata which we filled with goodies for the kids as well as a giant bag of confetti. The kids LOVED the confetti. Birthday Girl Wears: Top by Country Road, Mamapapa skirt and Bensimon shoes both purchased at White Nest in Blairgowrie. Polka dot bow tie by Milk & Soda. Games/activities: No official games/activities were organised. All the kiddies that came were Ruby's cousins and close friends and they played up a storm together - riding bikes, jumping on the trampoline, playing dollies and just your general good old-fashioned running around backyard party fun. 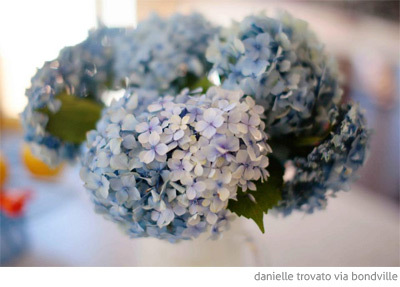 Tips: I am a creative person but I am not crafty! 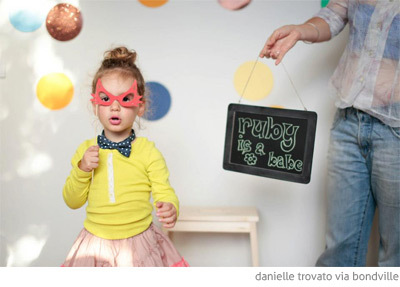 However there are still so many things you can do yourself for a kids party to make it a bit special! It doesn't need to cost the earth. The giant confetti wall we made from coloured cardboard we got from Lincraft and stuck on using bluetac. Simple, easy and cheap but was so effective and fun. Cooking/Baking etc also not my thing but again you don't need to put pressure on yourself. Party food does not have to be fancy, it just needs to be fresh and tasty! People like being able to just grab something fuss-free while they sit or walk around. Make the most of your space and ensure that there will be a flow to things so that your guests will feel relaxed. The best thing you can do is ensure there is space created so that the kiddies can happily play so parents can RELAX and enjoy too! 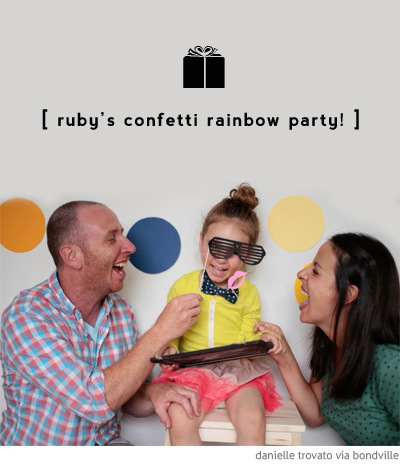 Something special: We set-up a fun little mini studio in Ruby's playroom to use as our photobooth. I continued the confetti theme and made another giant confetti wall to use as the backdrop. I popped a little stool in the middle and piled all the guests in with some props and had lots of laughs! 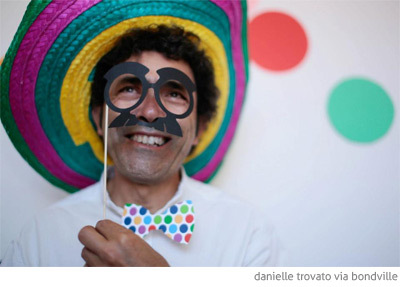 The result is an album full of bright, fun, quirky photographs of all our guests. This was absolutely my favourite part of the party. It meant that I could ensure I would capture the event and all the guests which isn't always easy to do when you are hosting. 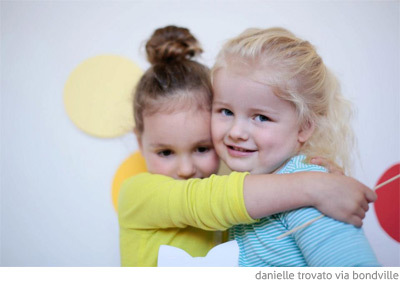 Thank you Danielle! 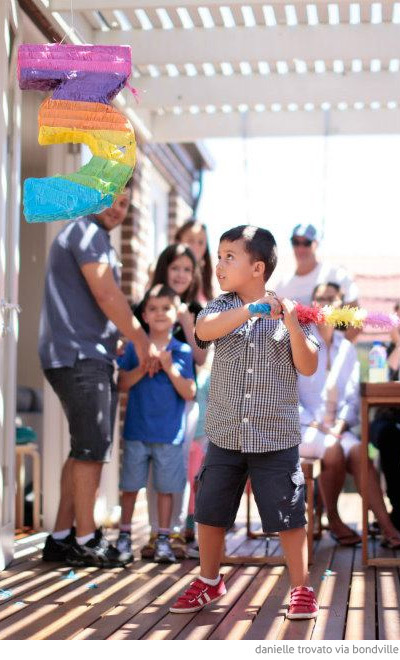 If you would like to share your Australian real kids party here on Bondville, please head to my submissions page for more info. I'd love to hear from you. That is absolutely gorgeous. It's funny because we did a similar photo booth for our wedding and we loved it too. People had so much fun with it. Happy Birthday Ruby! Hi Cybele - yes so fun! 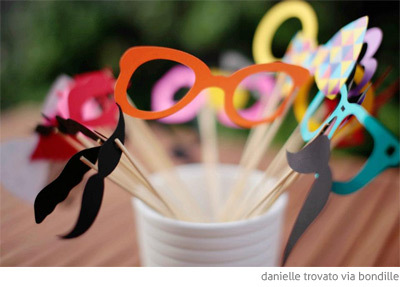 How cool that you did a photo booth for your wedding. Such a great way to get people to relax a little. Glad you liked! Such a fabulous and colorful party. Your little princess is very pretty.